Product #21389 | SKU SS1001 | 0.0 (no ratings yet) Thanks for your rating! The brain of the Second Shooter system, the Kessler Crane Second Shooter Controller lets you connect the system's slider, pan, and tilt axes via Cat5 cables and control them remotely. Second Shooter™ is a revolutionary motion control system that boasts a sleek and compact design, feature-rich operation and an incredibly intuitive user interface. Featuring 100% repeatable motion control for live-mode, looping, time-lapse and stop-motion applications. 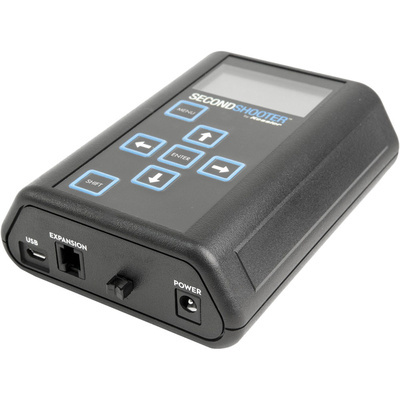 Unlike stepper motor based moco systems on the market today, Second Shooter™ receives feedback communication from digital-encoded motors in determining motor positions to ensure precise control. Second Shooter™ provides users with ultra-smooth and quiet motion control, making it an outstanding companion on any job. Second Shooter™ is motion control for the masses. An affordable and comprehensive solution that will meet the needs of large production houses and one-man-bands alike. With the ability to set up and operate quickly, it can be deployed in run-and-gun environments just as easy as it can be used in dramatic astro-timelapses. Don’t settle for anything less than your best - put a Second Shooter™ to work for you today.